As we are planning for the future. We are working on the mechanics and scale fuselage for the Kaman H43 Huskie. We feel this unique model will be welcomed, for no one has produced this helicopter in the United States, as far as we know. We plan to use some well known, top notch scale RC modelers for this project. We will keep you updated. 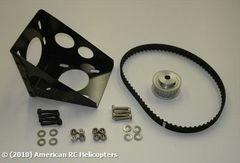 American RC Helicopters will produce the Jet Ranger with more scale detail, and provide upgrades to rigid rotor, two and four blade rotor heads. 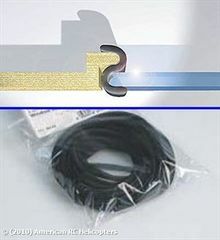 Window mounting channel, rubber, 5 m (15ft) This soft, highly flexible extrusion makes mounting windows, windshields and glider canopies in model airplanes, helicopters, boats and cars, quick and easy. Tom Gregory at IRCHA. Even after 14 years out of production, almost all who came to the exhibit knew the legendary RC helicopters at first site. The helicopters pictured are the original display models made for Franz Kavan and used in brochures and advertisements.